So yes, I did post that I'd ordered a drum carder and was taking a dyeing class, then abandoned the blog for 3 weeks. Sorry about that. The drum carder arrived 2 days after I ordered it, and I've been having fun making up batts, and being able to experiment with colors and fibers. The first is superwash wool, faux cashmere (nylon) and angelina. The yellow and pink are both anonymous wool blends - the pink also has mohair. One of the ideas I'd had before buying a carder has turned out to be even nicer than I'd anticipated. 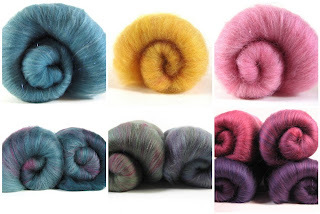 Sibling batts use the same fibers in the same colors, but are blended in different ratios. The bottom row of batts above are some of the sibling batts I've created in the past couple of weeks. The first two are 3 colors of merino plus a little firestar. The last is 2 colors of superwash wool plus some angelina. They've seemed pretty popular on Ravelry. There's a lot more control with the painting over which colors hit how much of the fiber. Also, one of the things I found interesting was how different fibers absorb the color. The two yellow/green/blue braids on the right were painted at the same time, with the same dyes in the same strengths and using the same technique. The same is true of the purple/peach braids on the bottom row. In both cases, the superwash wool took the colors more strongly and ended up more vibrant than their non-superwash counterparts (merino and corriedale). 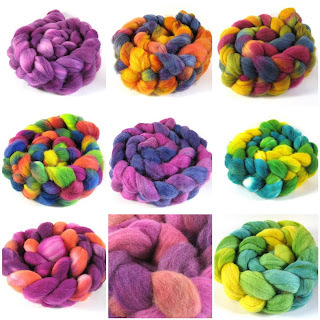 At any rate, since I now am having fun creating far more fiber than I can spin, I plan to start selling batts and dyed top in my Etsy shop (which I will update soon, I promise).